More than 23,000 wildlife images have been captured during 2013! This gallery shows some of the best photos from the year. To see more photographs taken by our camera-traps, please visit the Image page on the HOSCAP Borneo website. 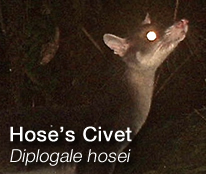 This entry was posted in HOSCAP Borneo, Photographs, Project Information and tagged banded civet, Baram, bearded pig, Borneo, Bulwer's Pheasant, Carnivores, Collared Mongoose, conservation, endangered species, HOSCAP Borneo, Hose's Civet and Small Carnivore Project, Hose's Langur, Leopard Cat, Malay Civet, Malaysia, Marbled Cat, Mouse Deer, Muntjac, pangolin, Sambar deer. Bookmark the permalink.